Do you have a loved one in uniform? 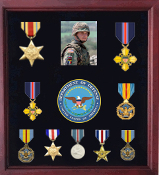 Recently retired from a long, proud military career and tired of watching all the medals and badges of honor you fought so hard for collect dust? How about an Awards Display Case from Flag Connections? 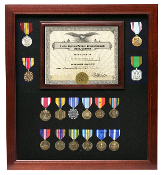 Whether it's for birthdays, graduations, Veterans' Day, or retirement, our vast array of Awards and Military Frames and Shadow Boxes always has something to fit the occasion for that special someone in your life. 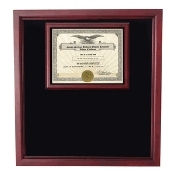 All of our Awards Display Case beveled frames are constructed out of sturdy Solid Oak or Solid Walnut with a durable plexiglas front and laminated panel backs. Manufactured in California, these beautiful and proudly crafted American frames are the ideal way to honor proud Americans. There are raised mounting surfaces available that come with necessary brackets and hardware for easy at home installation. 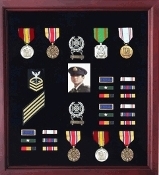 The Awards Display Case can accommodate up to 8 full sized athletic and military award medals while leaving aside plenty of room for insignia, badges, and other laudatory honors and memorabilia. Without the raised surfaces included you have the additional freedom to piece together your own free style layout. Not sure of the best way to mount your collection or how to present it to your loved one? Allow us at Flag Connections to help you surprise your loved one! Our committed staff can provide you with excellent suggestions for display case layouts. 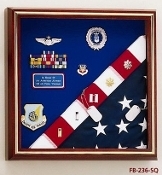 Inside these durable cases, the medals, ribbons, rank pins, crests, patches and special photo(s) will rest, mounted or unmounted, on a bed of luxurious Crushed Velvet. 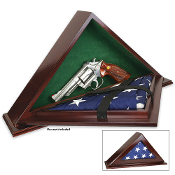 This display case is available in Velvet Colors coordinated appropriately to all branches of military service as well as our heroes in uniform at home - law enforcement agencies, firefighters, EMS personnel. Velvet color backgrounds are also coordinated to athletes and fraternal orders. You can also personalize your shadow box on the inside with our laser engraved black on brass metal plate. Choose the plate that designates the Rank, Name, and Service Dates of you or your loved one, as well as a wooden plaque to complement the frame and surface mountings of your display case. When completed, your display case will tell a totally unique story of your loved one in uniform and how they proudly devoted their lives and careers to their country. All of our Award Cases will provide a true testament to your service, or that of a comrade in arms, a friend, or loved one. Searching for a gift for your loved one in uniform who seems to have everything? A visit to Flag Connections will have you on the right track in no time! We've got everyone covered with our vast array of Shadow Boxes and Awards Display Cases – recognizing all branches of the U.S. Armed Forces as well as those serving in uniform at home – our every day heroes in law enforcement, firefighters, and paramedics. Our way of saying thanks is also their way of keeping their story alive to be cherished and remembered by the generations to come. 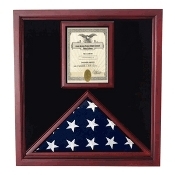 At Flag Connections, we stock only the highest quality frame and shadow boxes, built with American lumber, and built by the proud hands of dutiful American craftsmen. as your loved one in uniform deserves only the best. 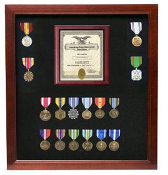 Each bevel cut frame can store up to 8 full size medals while leaving exuberant space for displaying service photos, insignia, wings, badges of honor, service medallions and other memorabilia, as well as room for a commemorative plaque. For styling made easy, ask about our surface mounts, that allow ideal space and coordinates for storing memorabilia and keeping them in as mint shape as they were on the day they were awarded. Keep each proud day of your loved one's career fresh in their minds – the perfect way to instill a joyful sense of pride and nostalgia in your loved one – keep their days of service as golden as they stand out in your loved one's memories with this beautiful retirement gift. 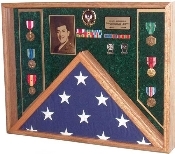 Personalize the tribute to your special serviceman or woman with a black on brass subscription in your shadow box display case – an elegant and professional touch. 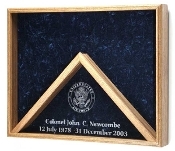 Each Deluxe Awards Case shadow box case also comes with an embossed 2 1/2” emblem. 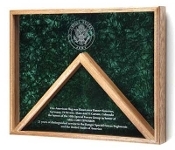 The frame's outer dimensions range up to 18” W X 20” H, for the Deluxe Awards Display Case. The Deluxe Awards Case makes an elegant and truly patriotic decoration for all homes and offices. Let the world know how proud you are of the special man or woman in uniform in your life! Each Deluxe Awards Case comes with its own simple hardware kit for wall mounting and installation as well as a handsome wooden easel for easy desktop and workplace displays. Each case can also be displayed horizontally or vertically, making it a perfect fit in any home or office. Make proud memories last forever! Capture them with a shadow box!